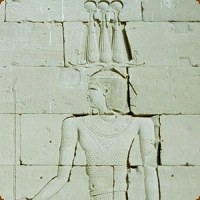 Depicted wearing a crown of rams horns surmounted by high plumes, sun disks and cobras. The Egyptian name is Merwel, but the Greek version, is found in a text known as the 'Vision of Mandulis'. The Temple of Kalabsha was originally located at Bab al-Kalabsha (Gate of Kalabsha), and was situated on the west bank of the Nile River, in Nubia. It was originally built around 30 BC during the early Roman era. The temple of Kalabsha was relocated after the Aswan High Dam was built, to protect it from rising waters on Lake Nasser.